Addiction to opiates/opioids is no longer a hidden issue - it is in plain sight. Addiction to opiates is resulting in unprecedented overdose death. In recent years, Ohio has seen an increase in the rates of drug overdose deaths, 86% of which were opioid-related (2016). These numbers continue to rise in counties across the state, being further compounded by fentanyl overdose deaths. We are seeing a similar trend in Franklin County. Franklin County Public Health in partnership with Columbus Public Health, Maryhaven and Central Ohio Hospital Council provides free naloxone trainings where participants learn about the different types of opiates, signs and symptoms of an opiate overdose, and how to administer naloxone. 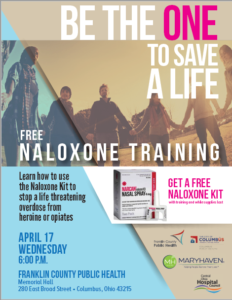 At these community trainings participants can receive a free naloxone kit, upon completion of the training (limited quantities may be available). Naloxone kits are available for community participants only. Agency particpants will not receive "free" naloxone kits. These trainings are only conducted within Franklin County. Please click here for other Project DAWN sites. Interested in hosting a naloxone training? Please fill out the request form and an FCPH staff member will contact you. Click on the images above for larger/printable version of the flyers. When your medicines are no longer needed, they should be disposed of promptly. Consumers and caregivers should remove expired, unwanted, or unused medicines from their home as quickly as possible to help reduce the chance that others accidentally take or intentionally misuse the unneeded medicine, and to help reduce drugs from entering the environment. In Franklin County, there are several drug drop boxes. To view locations outside the 270 outerbelt, zoom out on the map by clicking the minus sign in the upper left corner. Click on the image above for a PDF version. 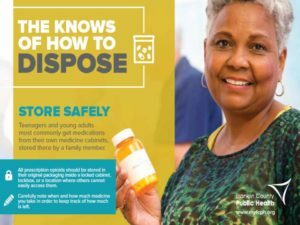 As part of the Franklin County Opiate Action Plan, Franklin County Public Health has partnered with the ADAMH Board of Franklin County to distribute safe medication disposal bags. These bags contain a material that, when mixed with water, deactivates the drugs. Bags will be available at community naloxone trainings. Bags (one per person) can also be requested by filling out a form on ADAMH's website. Franklin County Public Health (FCPH) has been awarded the Prescription Drug Overdose grant from the Ohio Department of Health to mitigate the opioid crisis in Franklin County. FCPH works in partnership with the Franklin County Opiate Action Plan, collaborating with community partners in prevention, harm reduction, emergency response, and treatment. To read more about this grant, click here. The Franklin County Opiate Action Plan was created by the Alcohol Drug and Mental Health Board of Franklin County (ADAMH) at the direction of the Franklin County Board of Commissioners and Columbus Mayor Andrew J. Ginther. The new plan to addresses the ongoing opiate addiction and overdose crisis in Frankin County. To create the new plan, ADAMH collaborated with stakeholders from across the region, and gathered input from more than 100 experts as well as from people in recovery and family members of residents who have died from an overdose. The plan calls for the creation of a steering committee made up of local stakeholders such as the Central Ohio Hospital Council, Franklin County Children Services, Columbus Public Safety, the Central Ohio Mayors and Managers Association, and public health agencies, and identifies specific actions for each of the next three years to address each of plan’s overarching goals. To read the plan, click here. In 2017, Franklin County Public Health received a $74,648 grant from Ohio Mental Health and Addiction Services to purchase naloxone to provide to local law enforcement, emergency personnel and first responders so they can immediately respond to overdose situations in their community. The opioid epidemic is impacting all corners of life in our state. No household is immune, regardless of socioeconomic background. The Ohio Opioid Education Alliance was formed to prevent children and youth from misusing prescription opioids. Most parents are aware of the opioid problem, but the vast majority don’t believe opioid abuse is a threat to their child. In reality, opioid addiction is likely to start with the abuse of unused or unsecured prescription opioids that pervade Ohio households. The Ohio Opioid Education Alliance is a coalition of business, education, nonprofit, civic and government organizations committed to the education and prevention of opioid misuse and abuse. 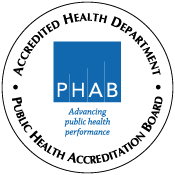 Franklin County Public Health is a member of the Alliance. Visit Denial, Ohio's website to find out what you can do to protect the next generation from the opioid epidemic. Franklin County Public Health in collaboration with Columbus Public Health and other community partners, have an online data system to view reports that provide data on drug overdose treatment, outcomes and prevention in Columbus and Franklin County, Ohio. Opioid overdoses kill an average of 7 Ohioans every day. Since 2007, unintended drug overdoses have exceeded car crashes as the leading cause of accidental death in Ohio. There has been a significant rise in fentanyl-related overdose deaths in Ohio. Fentanyl-related unintentional drug overdose deaths in Ohio more than doubled from 1,555 in 2015 to 2,357 in 2016. To find a treatment provider in your area, call the Ohio Department of Mental Health and Addition Services at 877-275-6364 or visit http://mha.ohio.gov/. Some pharmacies in Ohio sell naloxone without a prescription. For a list of participating pharmacies, click here.